Easy, tangy, spicy and full of probiotic goodness, this lacto-fermented hot pepper sauce will kick your favorite foods up a notch (or three!). Makes 1 pint. 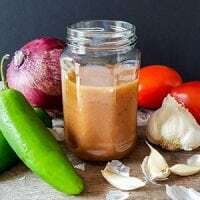 Add sliced jalapenos, onions, and garlic to a clean and sterilized pint Mason jar. In a small bowl or glass measure, combine tomato puree, allspice, and sea salt. Pour mixture into the jar. OR, for smooth sauce, blend all ingredients together and then combine in sterilized pint Mason jar. Gently tap the jar to dislodge air bubbles and pack the veggies down well into the liquid (if you have a Pickle Packer or Prepper Pro, use it!). Add fermenting weights to keep the veggies submerged. Secure the jar with your preferred fermenting lid or airlock. Leave on the counter for approximately 48 hours (less if warm). Add optional sweetening, to taste. Puree, if desired and not already smooth.